Numerous national surveys all point to an increased desire for time with family. Family vacations in the Poconos are unique and exciting for all ages, whether you want a getaway with the kids or a multi-generational destination family reunion. Among the family attractions include the opportunity to check out NASCAR at Pocono Raceway. Mountain biking or paintball are sure to keep the excitement in your Pocono family vacation. The kids will love playing at our waterparks or seeing the animals at the wild animal park. For a more laid back family experience, sightseeing on horseback or a scenic, historic train ride may fit the bill. Visit the Pocono Mountains and discover the best vacation spot Pennsylvania has to offer. 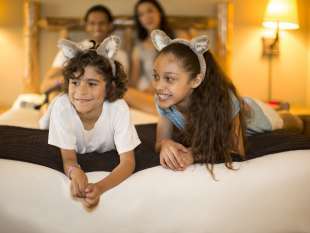 Stay at a family-friendly resort with children&apos;s programs that will keep the young ones entertained, along with many other Pocono activities. The Poconos is the perfect family vacation destination. Save a little by checking out these special offers for your next Pocono getaway. Come play in the Pocono Mountains! Plan your adventure at one of our family fun resorts.